Although protein is most often associated with muscle growth due to the fact that it contains amino acids, which help build your body's tissues, fat intake can help promote muscle growth as well. While the name of this nutrient leads some to believe it only causes fat gain, dietary fat intake does not directly relate to fat gain and may actually help you stay lean when gaining muscle. Consult a doctor prior to altering your diet. Dietary fat contains nine calories per gram, which is more than double what protein and carbohydrates contain, four calories per gram. Because of this, dietary fat can be helpful for providing energy to fuel exercise and other strenuous activity. Dietary fat also helps your body absorb vitamins, and promotes proper growth and development. The American Heart Association suggests consuming between 25 and 35 percent of your daily calories from dietary fat. 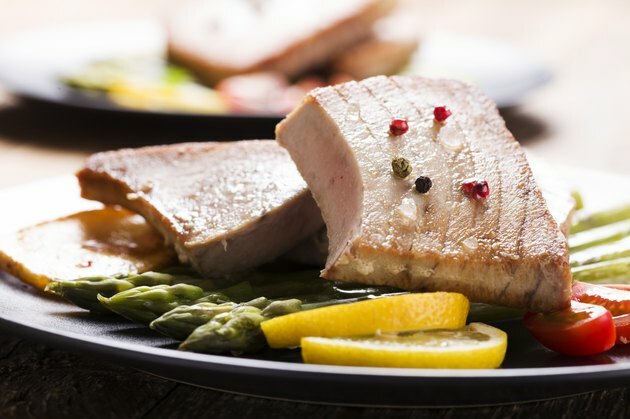 Omega-3 fatty acids are unsaturated fats that are found in fatty fish, olive oil and nuts. Omega-3 fatty acids are purported to improve heart health, but research indicates that this type of fat may also promote muscle gain. A study published in the October 2010 issue of the "Journal of the International Society of Sports Nutrition" found that six weeks of supplementation with an omega-3 fatty acid product resulted in a .5 kg, or 1.1 lb, gain in muscle mass and a 1.1 lb. reduction in fat mass. Saturated fat has traditionally been considered less healthy because it can contribute to increased cholesterol levels. Saturated fat is found in dairy and meat products, among other sources. Nutrition researcher Mike Roussell suggests that increased consumption of saturated fat may increase testosterone levels, especially if you lift weights. Testosterone is a hormone involved in muscle gain, so increasing levels of this hormone can promote increases in strength and muscle mass. Medium-chain triglycerides, commonly referred to as MCTs, are a type of dietary fat that are less likely to be stored as fat in your body than other fatty acids. This makes MCTs a preferred source of fuel for athletes, as the energy from MCTs can be accessed rapidly. In addition, MCTs can be used to prevent protein breakdown following exercise, so they can be a beneficial component of post-workout recovery meals. MCTs are found in high concentrations in palm oil, coconuts and MCT oil. The health and medical publication "Nutrition Review" suggests starting with several doses of 1/4 tsp of MCT oil throughout the day and increasing as desired.